A pair of Su-35S prototypes, B/N 901 and 902 (KnAAPO). 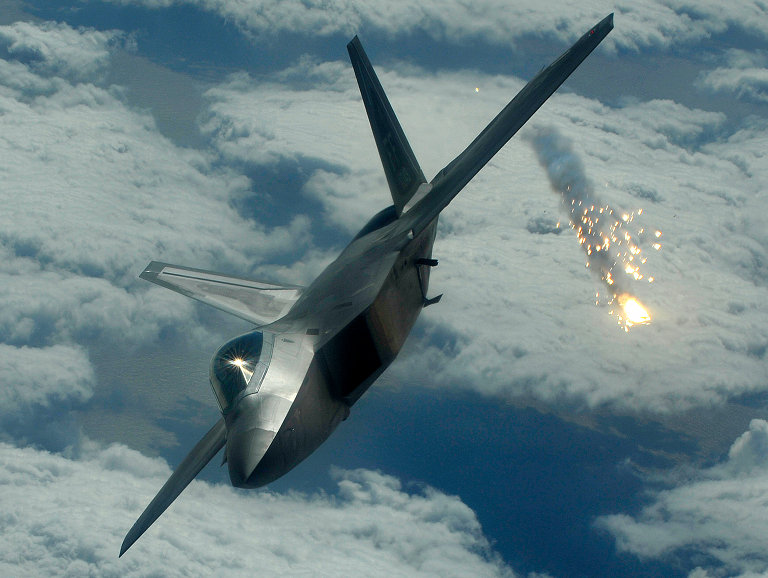 Above, below: F-22A Raptor ejecting flares from internal countermeasures dispensers (US Air Force). Above, below: left and right countermeasures dispenser bay doors opened (US Air Force). 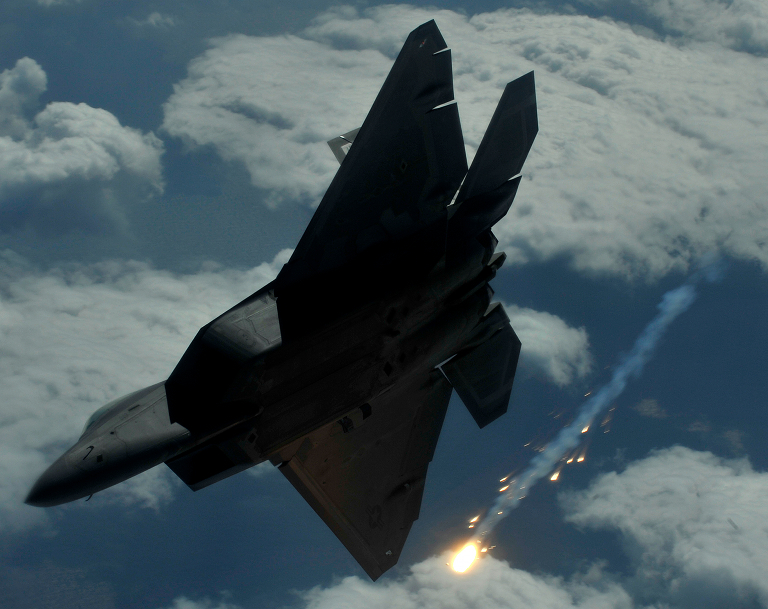 Manufacturers make stealthy gun-port openings and the F-22 has stealthy countermeasures bays on the fuselage sides, so they should be able to make stealthy electronic warfare openings large enough for effective countermeasures systems – the small and stealthy RFS/ESM antennas can collect the enemy’s signals continuously, the internal countermeasures generator forms the jamming waves for radar seekers, and directed energy for infrared seekers. 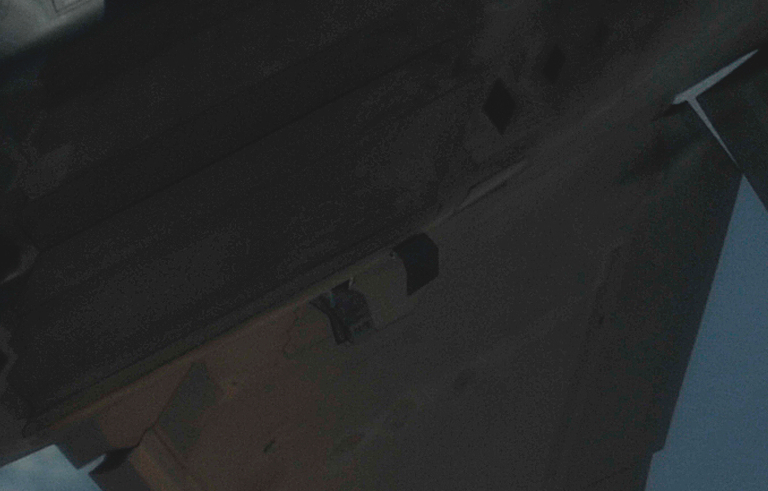 The countermeasure bays open, ports blast out disruptive radiofrequency and infrared energy as needed, then the bays close and allow the fighter to fade back into the ether. 1 In the electronic warfare game, electronic countermeasures can be broadly divided into three categories. 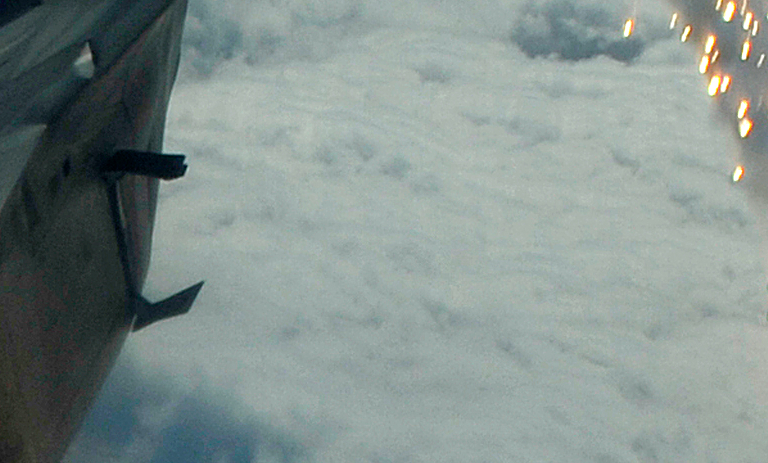 Support jamming equipment is used to defend other aircraft, and primarily disrupts search and acquisition radars, including engagement radars in upper bands with autonomous search capabilities. 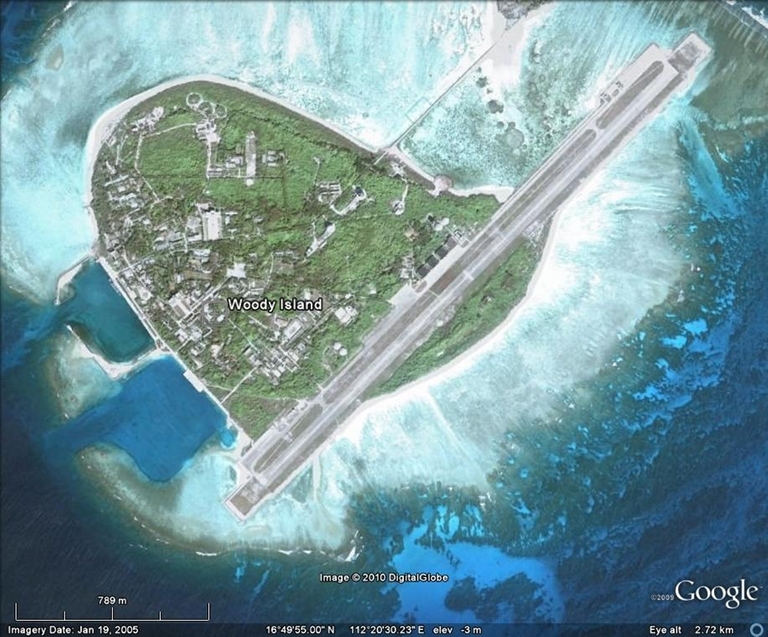 Terminal or “endgame” countermeasures are intended to disrupt engagement radars and missile seekers, and are traditionally carried by all categories of combat aircraft. Finally, conventional strategic bombers often carry high power jammers, intended to disrupt search and acquisition radars at long range, to preclude cueing of SAM engagement radars or interceptor aircraft. The design requirements for all three categories are sufficiently different to usually result in very different equipment designs and installations. 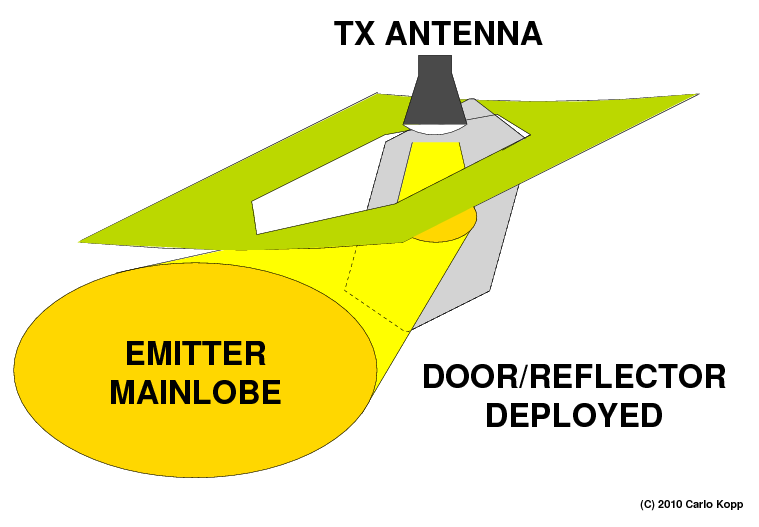 Classical endgame countermeasures carried by conventional tactical aircraft usually emit 1 to 2 kiloWatts of radiofrequency power, typically in the X/Ku-Band, but with some designs extending well below and above these bands. 2 Please refer Kopp C, Assessing Joint Strike Fighter Defence Penetration Capabilities, Air Power Australia Analyses, Vol VI, issue 1, Air Power Australia, Australia, pp. 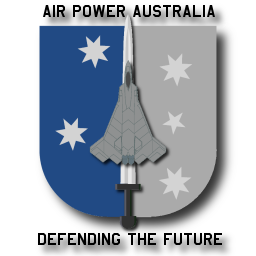 1-30; URI: http://www.ausairpower.net/APA-2009-01.html.